My latest article for Cinemontage, the Motion Picture Editors Guild Magazine. I spoke to Ben L. Cook, supervising sound editor of Netflix's Lost In Space. The Savage She-Hulk: Origin story. Hospital scene. One of Marvel's Avengers. Newly remastered. Support us on Patreon! Lesley Youngblood as Jennifer Walters. 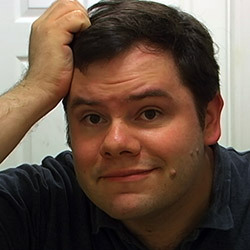 Writer, director, editor, effects, Garrett Gilchrist. I edited a version of this in 2010, but spent about half this month finishing the effects and remastering the footage. One of the more complex scenes effectswise. A lot of shots require frame by frame rotoscope painting to turn the She Hulk double (Carrie) green. I did 90% of that back then, but more was needed. Meanwhile there was a resolution problem with most of the greenscreen footage. Shooting SD MiniDV greenscreen is already a bad idea, as the color resolution is very low. This footage was even worse than that, so it took a lot of extra care to make Kierstyn's shots look presentable. I worked on the mattes carefully to keep as much detail as possible with her hair, and keep the sharp edges, rather than just having a soft fuzzy edge to things, which is all the low-res footage would have allowed normally. Once I knew her hair was working, the footage started to work. There's another scene with Mickie Banyas' nurse, but it kind of required some VO from Jen which I didn't get at the time. The feature was shot in full in 2007-2008. Most of it was edited in 2008-09. Due to lack of funds and time I stopped editing the film while working on this scene in 2010. I came back to it in 2012 and I think 2014, briefly. This is a newly remastered and pretty much finished version of the scene. Wanting to remaster the entire film and complete a few more scenes, I worked on editing the film for most of this month. More work is still required. Support us on Patreon! This 93-minute version of Shamelessly She-Hulk (2007-8, dir. Garrett Gilchrist) represents the editing done 2007-2010 plus about a month's work remastering and editing some previously-unseen material, improving effects and sound. I spent most of the time working on the hospital scene (as well as Titania and an ending scene which is not included here as it's still not ready). I would have liked to do more but gave myself a month's deadline for now. The film is still unfinished in places but this edit gives a fairly complete picture of what the film was intended to be. Shamelessly She-Hulk is a low/no-budget Marvel/Avengers fanfilm feature, shot in 2007-8 in Los Angeles. It was written, directed, and edited by Garrett Gilchrist, who also did most of the effects. A 2004 graduate of the prestigious USC film school, Garrett Gilchrist is well known for his viral film restorations such as The Thief and the Cobbler: Recobbled Cut (2007-2013), Henson Rarities and Star Wars: Deleted Magic (2005/2009). He had previously made various no-budget features such as Gods of Los Angeles (2002-5). He is a prolific artist and animator, known for the viral Doctor Who lost episodes animation project, Whosprites (2007-9). 55 hours of footage was shot for the film, including additional scenes intended to showcase other characters and set up a sequel. Due to the massive amount of effects and animation required, and lack of any funding, editing of the film was never entirely finished (after 3 years work). The unfinished edit received over 11 million channel views on Youtube. This 93-minute version of Shamelessly She-Hulk (2009, April 2018 remaster) represents the editing done 2007-2010 plus a month's work remastering and editing some previously-unseen material, improving effects and sound. While still unfinished in places, this edit gives a reasonably complete picture of what the film was intended to be. If possible, director Garrett Gilchrist would like to do further editing in the future. 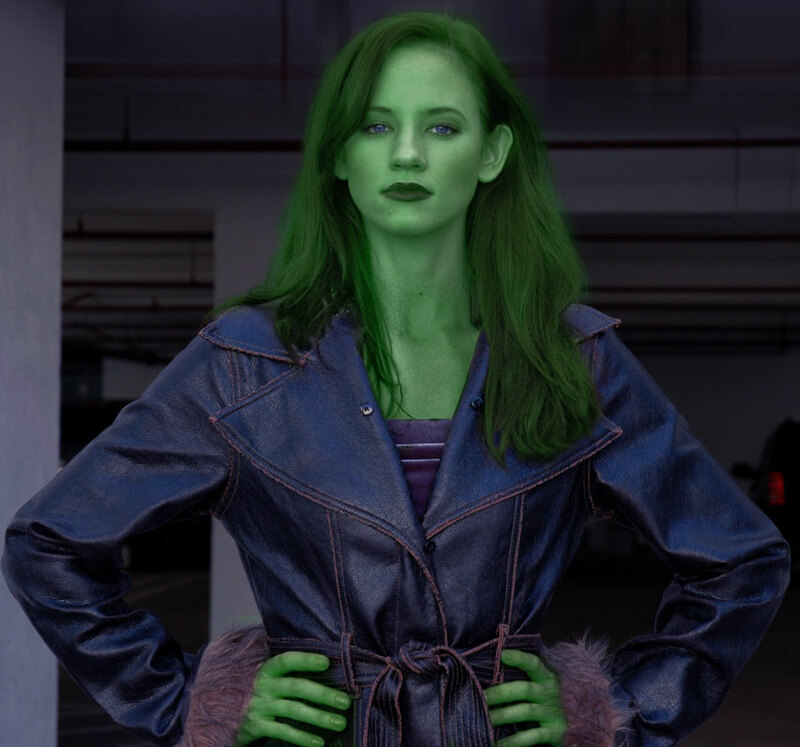 Kierstyn Elrod plays She-Hulk, with Lesley Youngblood as her alter ego, Jennifer Walters. A young lawyer living in Los Angeles deals with the trials and tribulations of becoming a famous superheroine (and member of Marvel's Avengers), and making a film about how all of that came to be. Visited by her cousin Bruce, who is on the run from the law, Jennifer Walters is shot by thugs hired by the gangster Nick Trask, and left for dead. Bruce saves her with an emergency blood transfusion, but in the process she takes on his powers and becomes a sensational new heroine. As her own father, Sheriff Morris Walters, declares war on the green "monster" she's become, and as Nick Trask declares war on her and her friends, Jennifer must decide if she's really the monster they say she is - the sort who would kill Nick Trask - or something entirely new. And she must decide if her blossoming romance with childhood friend Zapper is more important than her future as a superhero. In the process of making her film she takes down villains Titania, Weathermaster and more, and shares her concerns about how difficult it is to translate a comic book hero to the big screen. She-Hulk's scenes were shot in Santa Monica, January-April 2007, over a year before the Marvel Cinematic Universe took over the box office with Iron Man. It's a running gag in the script that a lot of Marvel movies had failed up to that point, and Jen is worried about making one. In her late-80s comic appearances, She-Hulk was aware that she is in a comic book. She-Hulk making her own movie here has that same fourth wall breaking quality. We also see in the film how finding out she was in a comic book changed her. The first four months of shooting were produced by J. Waters. Gilchrist tried to spend as little money as possible. This was not more than ten thousand dollars, half of which was a miniDV SD camera package for five thousand dollars. Technology has improved a lot since then. Shooting continued (including Jennifer Walters' scenes) in 2008 around the USC campus, with a budget of zero, and often a crew of one. Scenes of Nania's Spider-Man (and Gilchrist as director) appear on the "Spin Your Own Webisode" special feature on Sam Raimi's Spider-Man 3 DVD and Blu-Ray. Gilchrist and Nania met Sam Raimi at the L.A. Film Festival for this feature, which was about fanfilms. Afterward, Nania was a stunt performer in several Marvel productions including Infinity War and Daredevil. Goolsby who played Weathermaster (a version of Stilt-Man) later had a memorable appearance in Marvel's Agents of Shield S2. Spencer is a popular anime voice actor. Muscat's appearances include Shameless and Terminator 2. MiniDV has a very low color resolution, so it took extra work in post to make the greenscreen scenes look remotely acceptable. New techniques were used for the hospital scene in the April 2018 remaster. Often scenes required frame by frame rotoscope to paint She-Hulk green. Many scenes remain unedited and unreleased, although the main storyline was completed. Actors auditioned for, and some scenes were shot for, a proposed sequel (or sequel trailer). Footage was shot of Blade, Black Widow and Punisher, released as a short video "Done and Dusted," or "Forsaken." Best regards, and thank you again for your help." Another article about a video of mine - although sharing the wrong version. Lot of familiar Thief footage from our archive in this Youtube video. Thief and the Cobbler Recobbled Review. And another, although one of those types who only cares about the Nostalgia Critic's "review." This review of the Oscar-Winning A Christmas Carol adopts an interesting rating scale: "As an adaptation of A Christmas Carol it is far from Superior but as a short film in its own right it is absolutely exceptional. 6 Garrett Gilchrist restorations out of 10 (with the caveat that in any other context it’d be a 9 or 10)"
In 2007, we shot the greenscreen scenes for She-Hulk, like the entire movie, on MiniDV, which has a very low color resolution and isn't cut out for chromakey work. It took a lot of extra work in post to make the shots look remotely clean. This scene had even lower resolution due to a camera problem, where it was accidentally matted at top and bottom. Coming back to it 11 years later, I reasoned that a greenscreen matte is really just a black and white video image, and so I created one very carefully and gradually for each shot based on what I WANTED the shot to look like in different parts of the frame, going through different filters and iterations until it looked sharp. I went soft enough that the edges wouldn't look jagged, but then sharpened that up afterward with more contrast. I handled her hair separately in a very delicate way, pulling from the luminance instead of the chroma, and once I was able to bring some detail to her hair, I felt the scene started working. Especially in the first shot as she leaves her bed. I used the same mode of thinking on another recent project, to make a "bluescreen" shot out of something that wasn't actually shot on a bluescreen (but rather against a vaguely blue wall, in HD). This was a lot of work for a final product which will still look dated and subpar, compared to how we could just shoot it with today's technology, but as with my restoration work I take it as a challenge to make the footage look as good as it can even if it wasn't shot that way. You might also notice the absurd amount of usually frame-by-frame rotoscope which turns her skin green in this scene. Done in Photoshop.